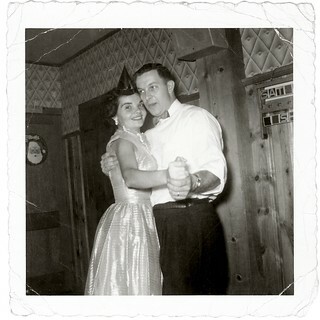 My parents met on a blind date on New Year’s Eve in 1952. At the end of that first date, at about 4am in the morning, my father proposed marriage to my mother. They formalized their engagement on Valentine’s Day 1953 and had a June wedding in that same year. My father died in May 2003, just three weeks short of their 50th wedding anniversary. We miss him dearly. This photo of my parents is not from that fateful first date but was taken just a few years later at a New Year’s Eve party in the mid 1950’s. I’ve always imagined that this picture pretty much sums up what that first date would have looked like. Love at first sight? The father that I knew was anything but spontaneous and he resisted change of any sort. Even growing up with full knowledge of this story, I was always a bit skeptical that such a thing could really happen in today’s world. And then I met my wife. But that’s another story. Here’s wishing you a happy, prosperous, and dare I say it, love-filled New Year, flickr friends! Hey, stay out of trouble.